That pretty much sums up my 2013! At the beginning of 2011 I was inspired to start recording some of the things I was doing out of curiosity. Specifically I wanted to track the games that I played and the music that I listened to. I wouldn’t exactly call it a new year’s resolution but I was determined to stick with it and I have. Now, three years later, I’ve recorded every single game I’ve played and every album I’ve listened to. Since this is a board game blog I won’t share my fastening music history but I will indulge you with tales of the games I’ve played (or at least the data I’ve collected). One thing’s for sure, the games you love and think you’re playing are not necessarily the ones you’re actually playing. So let’s start with my Nickle and Dime list, I know it has bias towards shorter games but it’s still worth looking at. Here it is presented in wonderfully abbreviated microbadge form, the number on the left is the play count. The top three (Dominion, Ascension, Race) have remained strong across all three years. They are all relatively quick card games that have had a steady stream of expansions. In fact all three had an expansion (or two) that came out this year. 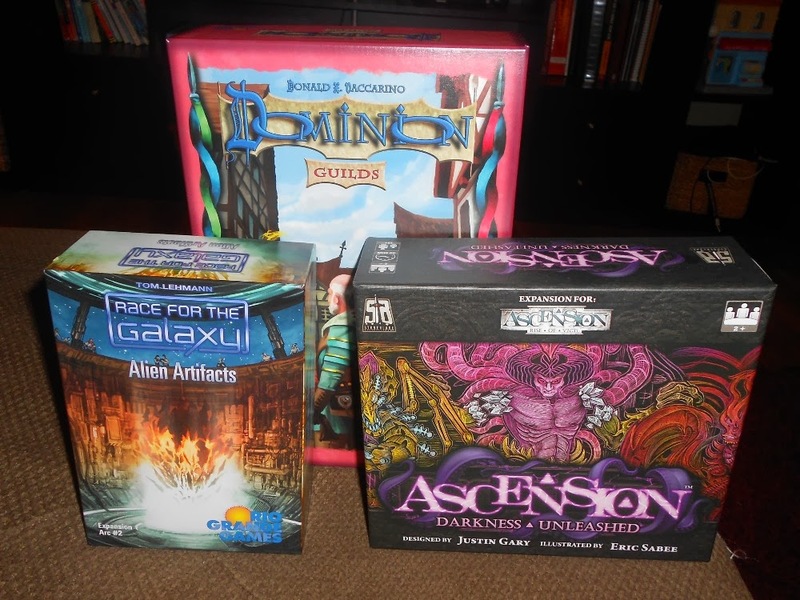 Dominion is popular with my family and work (responsible for the big spike in 2012) whereas Ascension and Race are popular with my wife and family. 7 Wonders (#4) has nearly identical factors but is not great with 2 players and hasn’t caught on at work so there was a dip in 2013 when my gaming group lost interest. Thunderstone (#10) is also very similar but can go a bit long and has tough competition with my top 2, especially Ascension. Kingdom Builder (#7) might not be a card game but it has some strong similarities to Dominion and has caught on at work which is where I’ve had most of the plays. Take It Easy! (#5) and Blokus (#9) have been very popular with my wife’s family and my plays have been almost exclusively with them. They are rated the lowest of the bunch because I don’t pull them out often with other groups but they are great for more casual crowds. Biblios (#6) and Scripts and Scribes: The Dice Game (#8) are somewhat similar in that my wife and brother-in-law enjoy them so most of my plays are from hanging out with them. They are both clever quick games and I enjoy them quite a bit more than Take It Easy! or Blokus. Interestingly enough two of the games from my top 10 most played were just released this year (Kingdom Builder, Scripts and Scribes: Dice). This pretty much reinforces the idea that quick games which you can play multiple times in a row will bubble to the top of these lists. So let’s switch over to something different. How about looking at my top 10 rated games and seeing how many times I’ve actually played them. Did my love for my favorites equate to them actually getting played? You can see my big three played games are all in the list: Race (#1), Dominion (#4) and Ascension (#6). They are all quick playing and have readily available opponents (wife, family, work) so they are at a significany advantage over most of the group. Innovation (#5) fits a similar niche of being a quick card game but my wife absolutely hates it and I fear it might have too much of a learning curve for my family. It does see some play at work when I suggest it and that is actually what has made up almost all of its plays. Moving on to the rest of the group we have longer, heavier games that won’t fit into a lunch period and are a bit too much for my family. So I’m pretty much limited to my game group on those ones which means that they’re competing with the latest and greatest new shiny games. The one that has seen the most plays is Agricola because it’s great with 2 and my wife will play it but I fear that Agricola: All Creatures Big And Small has replaced it for her. My attendance at my gaming group has declined since we had our daughter which coincidentally was in 2011 so if I did have data going back further it might show more plays which established these as my favorites to begin with. Or perhaps they have always had low play counts and I simply have phantom memories of playing them more. Either way at this moment I know that if I want to get my favorite heavier games played then I have to specifically request them or else they will get trumped by newer games. I love new games too so it’s certainly going to be a challenge considering that my game group is the main way for me to try out new games. Add in trying to get in plays of games that I’m hoping to review and things are looking pretty sparse for over half of my top 10. I think I’m at the point where just getting to play them all at least once per year will make me happy (curse you Galaxy Trucker). I would set a goal to play them all 5 times but the problem there is that it all depends on your group and it’s much easier in concept than execution. I’d rather not force people to play one of my favorites when they’d rather play the latest hotness so I won’t set a goal just to set myself up for failure. Pretty much everything from my Nickle and Dimes list of 2013 is associated with a new release so perhaps I was lying to myself when I said that I don’t primarily play newer games. So let’s rattle through the list and see how big of a liar I am. We’ll start with the big three again. We have Ascension which had a new block made up of Rise of Vigil in the spring and Darkness Unleashed in the fall. I primarily played with that block but do prefer the second one (Storm of Souls + Immortal Heroes) so it saw some play as well. Next up is Race For The Galaxy which barely squeezed in Alien Artifacts with less than a week left in the year. This accounted for only 9 of my 43 plays but release excitement got me playing at work so the expansion’s existence likely accounted for over half of my plays. Coming in last among the three is Dominion which saw the release of its final expansion, Guilds. The interest in Dominion at my work definitely peaked in 2012 (big time) and although it remained strong the year with the expansion it hasn’t seen much play in the later half so I’m not sure how it will fair in 2014. I do expect Ascension and Race to be on top again in 2014 but perhaps it will have company from something else? Part of the reason for Dominion cooling down was the introduction of another Donald X gem at work, Kingdom Builder. It has a lot of the same qualities as Dominion: quick playing, variable setup, and expandable. It’s not a brand new release but I did play it for the first time this year and picked up the first expansion, Nomads, for Christmas so it’s relatively fresh. Moving on down the list we have almost all releases from 2012: Scripts and Scribes: The Dice Game, Guildhall including the Job Faire expansion from this year, Agricola: All Creatures Big And Small, Pirate Dice, Seasons, and Voluspa. If you dip a little farther down to games that barely missed the list you’ll find a couple more: Morels, Fleet, and Spyrium (2013). The only “older” games that cracked my top 10 were Blokus and Eminent Domain which has an expansion on the way shortly. Rounding out my Nickles are Biblios, Innovation, and 7 Wonders. Hopefully those three will continue to show up in the coming years. I picked up the first expansion for Innovation, Echoes of the Past, and am hoping to be able to try it out once I get a more consistent opponent as it has an even bigger learning curve than the base game. I’m also interested to see whether 7 Wonders gets picked up again by my gaming group once the latest expansion comes out. Overall I’d say it was a pretty good year, I’m more or less a year behind the curve on new releases as most of my new games played are from 2012. We’ll see if this trend continues into 2014. With expansions however I’m pretty up to date. I would like to see some new games break in my top 10, if you only look at the base game then my newest game there is from 2010. I’m not sure anything from 2011 has a chance but 2012 and 2013 both have some titles that could make it given more plays. Thinking back to my top 10 I’m hoping to get all of my favorites played at least once this year, perhaps even twice. I’d really love to play every game that I currently own (currently 67 games) once but that might be pushing it a bit so I’ll just start with my top 10 and maybe extend that to everything that I own which I’ve rated at least an 8 on BGG. I’d also like to continue using my play records to trade away some of the games that I’ve been holding on to in hopes that they would get played but never do. I started to do this last year and even though it made me a little (or a lot) sad I was able to tone down my collection a bit and make room for some new games. Looking at my plays from 2013 I think I have thoroughly proven that I do indeed drink the kool-aid of new game hotness. With that in mind I don’t have to feel so bad about thinking of all the exciting new stuff that I’ll get to play in the coming year. After all, this is a board game blog and I’m pretty sure that’s one of the primary things you would expect coming from us. So here are some of the games that I’m looking forward to playing more of this year, you can be sure of some reviews along the way. Blueprints – I got this one for Christmas and have already introduced it at work to much success. I liked the concept of building with dice from the moment that I heard about it and am greatly enjoying the implementation. It’s interesting to hear that another similar game, Cubist, is coming out soon. I’ll be itching to try that one as well. Canterbury – This one seems to be having some mixed reactions. There are some that are praising it and some that compare it to playing a spreadsheet (if I remember correctly). I don’t mind the sounds of that so perhaps I’ll mix it in with the praise and give it a shot. I really like the look of the board and think it sounds intriguingly simple. Now I just need to convince someone from my group to buy it. Or simply wait for the next big math trade. Concordia – I’ve liked Mac Gerdts exploration of the Rondel mechanic and this game sounds to be just as refreshing. Now switch out the rondel for a hand of cards but still impose similar limitations to what you can do and how you can plan ahead. I’m sure this one will show up in my group once it arrives in the states. Ginkgopolis – Well I’ve already revealed that this one is threatening to be my new favorite game. I’m hoping to do a game order with some Christmas money so it will soon be mine! Now I just have to play it several dozen times and see how high it can make it into my top 10. Glass Road – This is the Uwe Rosenberg release that I’m the most excited about from last year and I’m tempted to include it in the same order as Ginkgopolis despite not having played it yet. With Ora Et Labora Uwe pushed the complexity envelope a little too far for my taste so I’m happy to try out something a little bit lighter from him. Keyflower – I played this one back in the spring and have been having the hardest time actually getting it back to the table despite really wanting to try it again. There’s even a brand new expansion that’s waiting for me to start playing the base game already. That’s it, I’m going to carry this one around with me until I can convince someone even halfway interested to play it. Legacy: Duke de Crecy – I’ve heard some comparisons to Race which will pretty much turn me on to any game. Even if it’s just cards with special powers it’s probably enough to get me to try it once. I really like the idea of having a growing family throughout the game so I’d say I’m sold. Nations – I tried this one for the first time last weekend and it was fantastic. It went a little bit long but I don’t mind for all there is to explore in this one. The abstraction of advancing through the ages by using cards is done perfectly while still having a lot of attention to historical details. I’m really looking forward to my next play! The New Science – I don’t usually care too much about theme but this one hits the math/science nerd in me perfectly. I mean what math major wouldn’t want to play a game about the 17th century Scientific Revolution? Everything about this game is absolutely spot on for recreating that setting and I love it! Snowdonia – I love me some worker placement and I’ve heard some good things about this one. Traditionally I’m looking for something nice and heavy but I’d also like to be able to spread the worker placement love with everyone so having something a little more accessible would be nice. All that in about an hour, sign me up. Spyrium – A buddy of mine got a copy of this at Gen Con and I was extremely jealous since I had to miss it this year despite living in Indianapolis. I’m a Caylus fan so when William Attia comes out with a new game you know I’m going to try it. I really like the novel take on worker placement with a splash of tableau building, that’s a winning formula right there. I finally picked it up for Christmas so I’m hoping to get lots of plays in this year. Suburbia – I finally tried this one out a couple of weeks ago and boy do I feel like I’ve been missing out. It’s not quite Sim City the board game but it captures some of the same feeling that made it one of the great computer games of the 90s (though technically it came out in ’89). I really like the tile drafting system and score board thresholds. It’s been fairly popular with my gaming group so I’m sure if I ask for it I will not be turned down. Terra Mystica – I had only a single play of this last year but it was one of my highlights and we even played with an incorrect rule. There’s a lot going on here and I’d like to get in a play where I’m not totally overwhelmed for half of the game please. Greed – You know if Donald X comes out with something that I’m going to be interested. I don’t know much about it yet but it has cards and drafting I think. When I first heard about it I wasn’t big on the theme but I’ve since given it a second look now that I know who’s involved. Roll For The Galaxy – I’ve been waiting for this one nearly as long as I’ve been waiting for Alien Artifacts! Now that I have the sweet taste of that Galaxy in my mouth I want some more. The details are still pretty sparse on this one but it’s as close to a blind buy as anything that I can think of. Come on Rio Grande! Roll Through The Ages: The Iron Age – As if one dice game by Tom Lehman wasn’t enough I now also have the sequel to the incredibly interesting Bronze Age. I felt like the base game didn’t have enough variety for my taste and I never really got around to printing out the Late Bronze Age sheets before I traded it away so I’m very excited to see how this one turns out. S-Evolution – I grew up on trick-taking games and this one throws a huge twist on it by adding in a civ theme. I’m really hoping that this one delivers on the potential because what I’m imagining for how this will play is nothing short of amazing. Sail To India – I like simple games that push the envelop for how much you can do with very little. This one has some dead simple rules and really ingenious concepts of how to use just a few components to deliver some good depth in a short time frame. Well at least that’s what I got from looking over the rules. Eminent Domain: Escalation – This is one of the two games that I actually broke down and Kickstarted so I’m extremely excited for it to get here already. I really like a mechanic mishmash that Eminent Domain has pulled off and this expansion really looks to add some neat ideas. Fleet: Arctic Bounty – I really enjoyed Fleet. This expansion is adding two great things: variety and a 2-player variant. That should be just enough to finally get my wife to give it a try. If it’s a success then hopefully I’ll have another great 2-player card game to compete for my top 10. Kingdom Builder: Nomads and Crossroads – I really like what Donald X has done with his expansions. They add an incredible amount of variety without bloating his games. Kingdom Builder seems to be following in that regard. Now that I’ve gotten 20 plays of the base game in I’m ready for some expansions! Last Will: Getting Sacked – I’m a huge fan of Last Will. This expansion looks to add even more good stuff while addressing one of my biggest gripes, the lack of variety with the planning area. Hopefully I can actually convince more people to get past the rules/icons and give it a try. Voluspa: Order Of The Gods – I wasn’t expecting to like Voluspa as much as I did. I was thinking Qwirkle with some special powers, that could be light and fun. Instead I got one of my favorite games of the year. The base game included an expansion which really went a long way to making the game so great. I’m really looking forward to seeing how these new tiles will change the game in a similar way. Well that’s about it I guess, thanks for sticking with me. Or perhaps you just skipped to the bottom, you wouldn’t do that would you? Anyway, how was your 2013? Is there anything new or old that you’re looking forward to this year? Are you interested in getting a review from me for any of the games I’ve got on my to-play list? Here’s hoping for an amazing year! Definitely Nations! Is it Through the Ages Lite? Or Through the Ages *Too* Lite? Ooo, I’ve had a few people tell me that I should give Nations a try since I really enjoy Through the Ages. Are you planning to review it at some point? If there’s a lot of interest in something I will certainly prioritize doing a review for it. I put that list up for my own sake and to see what kind of interest there might be in reviews of these games. Nations is certainly an involved game so I don’t want to rush into a review but I would love to do it and some other heavier games this year.